Palaces can be seen anywhere in the world. In India, our home country also you can see different palaces. Pune is a city located in Maharashtra state, India. If you get a chance to visit Pune, you must see the Aga Khan Palace of Pune. When considering different places of historical importance in Pune, the Aga Khan Palace of Pune is having an important place. Majority of the people living in Pune have visited this historical palace. Even my mother also told me that she studied about this palace during her educational life in college. Anyway I got the opportunity to visit this Aga Khan Palace Pune as it was located very close to my house. I know those people who haven't visited this Aga Khan Palace in Pune or who are willing to visit this palace may be interested to know more about Aga Khan Palace. Another fact is that Aga Khan Palace Pune is also known as the Kasturba Gandhi Memorial or Kasturba Samadhi in Pune. 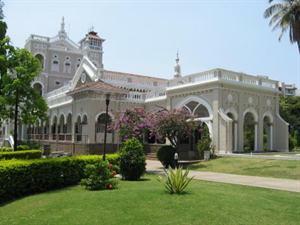 The Aga Khan Palace is situated in Pune city, Maharashtra state, India. When considering about the correct location of Aga Khan Palace, we can say that it is located at a distance of 2km away from Bund garden in Yerwada located in Pune-Nagar road. In simple terms we can say that this palace is a national monument of the freedom movement of India. This historical palace of Pune was built by Sultan Muhammed Shah Agakhan lll in the year 1892. The sultan built this palace as he wanted to help the poor people those residing in the neighboring areas of Pune who were drastically hit by famine of that time. Sultan Muhammed Shah Agakhan lll was the president of the League of Nations from 1937-38, 48th Imam of the Shia Ismaili Muslims and first president as well as founder of the All-India Muslim League respectively. It is believed that the palace was completed in 5 years with Rs 12 lakhs. The beauty of this historical palace is a main factor that is attracting tourists to Pune. This palace was the venue for the famous movie "Gandhi". The architectural style of Aga Khan Palace Pune has attracted tourists from different parts of India and the world to Pune. While entering the palace, you can see beautiful well maintained green gardens located all around the palace. Apart from this, you can also see decorated guest rooms and suites which will give you an idea regarding the royal past of heritage building. Another fact is that this palace comprises of spacious lawns and Italian arches. There are 5 halls for this building. Altogether the palace covers an area of 19 acres but the built up area is 7 acres only. When considering the different floors of this palace, we can say that the area of ground floor, first floor and second floor are 1756 sq meters, 1080 sq meters and 445 sq meters respectively. This palace has a corridor of 2.5 meters around the entire building. After reading this, you may be searching about the historical importance of Aga Khan Palace Pune. 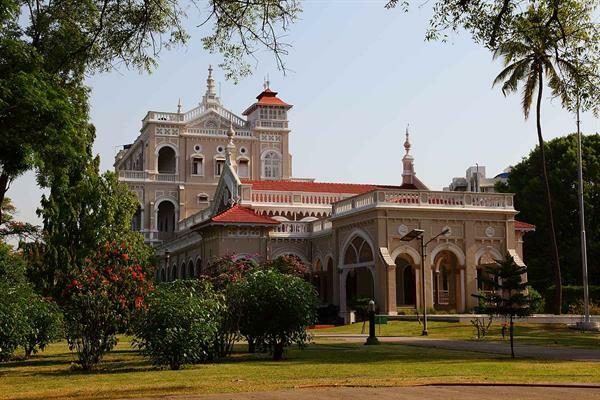 So read the rest of this article where you will get more information about Aga Khan Palace Pune. Father of Nation-Mahatma Gandhi, wife Kasturba Gandhi and Secretary Mahadev Bhai Desai were held as prisoners in Aga Khan Palace Pune from 9 August 1942-6 May 1944. It was during the Quit India movement in 1942. But Kasturba Gandhi and Mahadev Bhai Desai died during their captivity at this palace. It should be noted that both have memorials in their name in same complex. The famous architect Charles Correa designed the beautiful marble memorials of Kasturba Gandhi and Mahadev Bhai Desai. Aga Khan lV donated this Aga Khan Palace of Pune in the year 1969 to Indian people as a respect to Gandhi and his philosophy. Today this palace is considered as headquarter of Gandhi National Memorial Society and hosts a shop that deals with hand loomed textiles and khaadi. Also this building houses a memorial on Mahatma Gandhi where the ashes are kept. While entering the palace you can see the first room, which is named as the room of freedom fighters Mirabai and Riabharati Narayan, second room that of Sarojini Naidu, third room that of Mahadev Bhai Desai, fourth room that of Mahatma Gandhi (entry is not allowed here) and the next room a conference hall respectively. 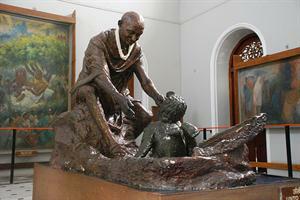 Inside the museum, you can see a collection of pictures that depicts the important incidents of Mahatma Gandhi's life. Apart from this, you can also see personal items like slippers, mala, utensils, clothes, a statue of Mahatma Gandhi reaching out to a child and many more. Other than this Kasturba's Saree, footwear, room in which Kasturba took her last breath, letter written by Mahatma Gandhi(the father of our nation) on the death of his secretary Mahadev Bhai Desai, beautification of walls by pictures of Indian independence movement etc. are some other attractive features of this palace. Parking space is available for vehicles in this palace. There are many tourist attractions in and around Pune city. You can read about Sinhagad Fort, Katraj Snake Park and Bedse Caves apart from many informative articles here. Now visitors are not allowed to visit the first or second floor or any where in palace except ground floor, like the rooms or jails of freedom fighters. Why is it so?